As a kid I loved magic. I still do, but back then I would buy inexpensive magic paraphernalia and try my hand at doing a few tricks. I was terrible. I can still do a couple of bad card tricks but that’s about all. One of my favorite tricks is the classic (more like ancient) cups & balls. Some say it dates back to ancient Egypt. I wouldn’t be surprised. 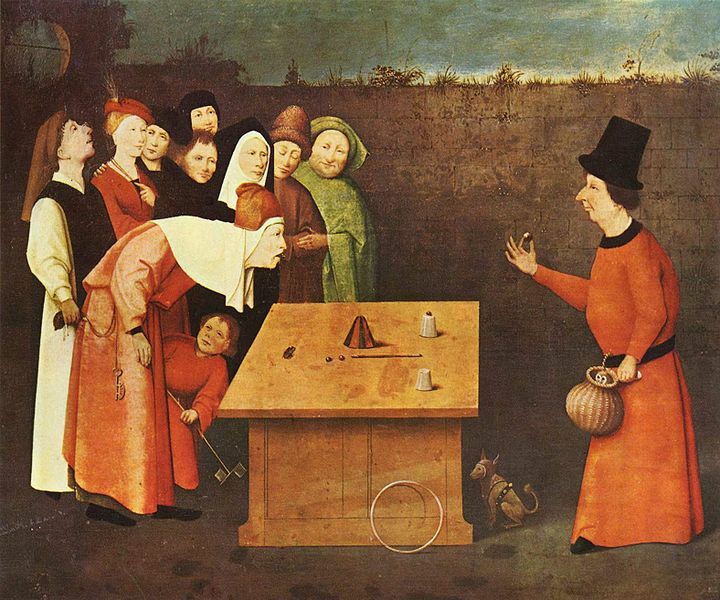 Cups & balls is primarily based on sleight of hand and misdirection – the two mainstays of table magic. It is such a fundamental trick that most magicians know it well, and there are a virtually uncountable number of online videos ranging from professional magicians to rank amateurs showing off their versions of the trick. Here are three worth viewing. There are more fanciful, complicated, and stunning magic tricks out there. Cups & balls is certainly not making the Statue of Liberty disappear, but it is a fun trick that can still astound, especially in the hands of a master.